One of the many reasons why I love the audiophile hobby so much is that it always affords me so many avenues to learn something new and interesting. For example, take the need to “ground” all your audio components. On the surface, grounding may seem like a boring concept. However, if you dig beneath the surface, it is anything but. Electrical theory 101, states that the wire that supplies power to our components has three conductors. The “hot” conductor supplies the current, the “neutral” conductor provides the current’s return path to the ground, and then you have the ground. So why is it necessary to have two conductors connected to the ground? It’s because they serve two different purposes. The neutral conductor in tandem with the hot conductor are part of a live circuit while the ground conductor is usually connected to the metal chassis of the component, and acts as a safety feature in case the hot or neutral conductors bypass their insulation and come into contact with metal parts of the components making them a shock hazard for any grounded person who touches the component. As most audiophiles know, the term “ground” refers to a connection to “earth,” which acts as a reservoir of charge. Electrical grounding is important because it not only prevents the component from becoming a shock hazard, but it also provides a reference voltage level against which all other voltages in a system are established and measured. When implemented well, grounding does not just eliminate shock hazards but it also minimizes interference and eliminates electrostatic buildup by draining away excess electrical charge. A good ground will stay at a constant voltage, and in the event that internal insulation fails, the ground will trigger the fuse / circuit breaker to stop power from flowing to the device, thus protecting grounded persons from experiencing an electrical shock if they touch the component. A well implemented ground system needs to have an appropriate current-carrying capability that serves as a zero-voltage reference level and should ideally serve as an infinite sink for an electrical charge by absorbing very high amounts of current without changing its potential. On the other hand, a poorly designed ground system could allow stray voltages to occur in the circuits of a component, which has the potential of creating noise in sound signals, which, in turn, can adversely affect the sonic performance of audio components to a significant degree. The traditional method used to establish a ground is to drive one or more ground rods into the earth / soil, and then establish a system where the ground components of electrical equipment are linked to it. However, in today’s fast paced world where instant gratification is the norm, that is not always the practical option. So what is an audiophile to do to ensure that their equipment is adequately grounded in a way that allows audio components to perform at their optimum level? Before I researched this subject, I was under the impression that inserting the three-pronged plug of a component into a three hole wall power socket automatically gave the components all the grounding that they needed for optimum performance. Now I know better. In a conventional configuration, a regular three-prong plug terminated power cable is supposed to provide the ground for a component. The potential problem here is that the ground wire in the power cable may not be configured to provide a path of least resistance, and therefore the optimum grounding for your component. This can potentially add as much as 10 dB of noise to the sound output of the component. A good solution is to provide your audio component with a ground path that is separate from the one provided by your power cord, and which does provide the required path of least resistance, thereby minimizing any noise in the sound signal that could be caused by stray voltages. A few years ago, I was given the opportunity to review a curious set of tweaks called Akiko Tuning Sticks which made claims that initially seemed quite outlandish. Akiko claimed that when you plug their Tuning Sticks into any of the RCA inputs or outputs of your audio components they enhance the grounding provided to that component, and thereby improve the quality of the audio reproduction. I was skeptical of the concept but when I tried this tweak the subsequent improvement in sound quality was so evident, it forced me to sit up and take notice. Since then, I am loath to knock any audio tweak, however bizarre it may seem, until I have tried it for myself. Enter the Synergistic Research Active Ground Block SE. This is a component that, like the Akiko Tuning Sticks, claims to enhance the grounding for audio components. What is different, however, is that while the Akiko Tuning Sticks perform this task passively, the Ground Block SE does it actively. The unit, which costs US$2995, consists of a 3″ by 6″ by 10.75″ aircraft grade aluminum box, which weighs in at 5.5 pounds. On the top of the unit there is a long copper bus bar with 44 ground ports of 2mm each (as compared to 18 ports on its predecessor), each port designed to reduce ground inductance between components. Wiring is all point-to-point using 4% silver solder. The unit comes bundled with a 5-foot SR Atmosphere Active Ground Block Cable that, on its own, retails for US$1999. This cable has an active shielding UEF cell incorporating a Swiss-made DC bias power supply and SR Quantum capacitors, which are housed in a carbon fiber cylinder. 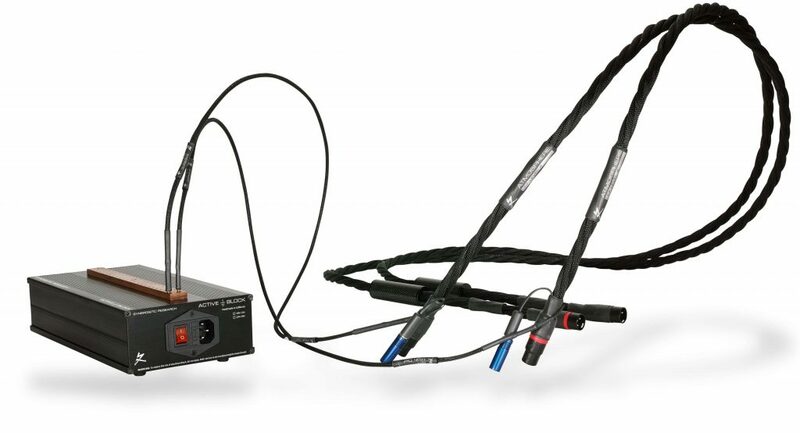 To deliver two sonic options, this cable is also equipped to accept SR’s Galileo UEF Quantum SX gold (for warmer sound) and silver (for more detailed sound) tuning modules. The dielectric is PTFE and ground plane technology shielding is used to enhance the performance. The SR Ground Block SE will provide a ground for not just your electronics but also your equipment racks, SR signal and power cables, and even your computer hard drives. The only components that SR advises discretion when connecting to the Ground Block are your power amplifiers. Here SR councils you to try it with and without the ground connection, then choose the option that sounds the best to your ears. The UEF ground filter of the SR Active Ground Block SE is three times the size compared to its predecessor. It is also equipped with the same active ULF field generator that is used in the SR PowerCell 12 UEF which re-clocks high frequency ground noise to the earth’s Schumann resonance. The SE version of the Ground Block incorporates an active EM Cell that is similar to the ones used in the SR PowerCell 8 power conditioners. These actively remove noise from the ground to deliver a blacker background and better dynamics. 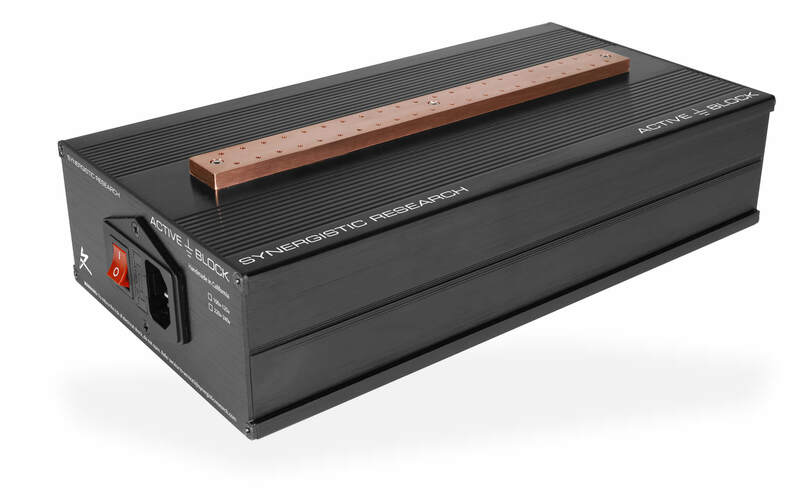 To connect the Ground Block to your components, SR developed special Hi Def ground cables that are made of 99.9995% pure silver Air Strings and graphene conductors in an air dielectric with a graphene shield. I received the review sample of the SR Active Ground Block SE with eight ground cables which I connected to my system (comprised of a Bryston BP26 preamp, Bryston BDP1 digital audio player, Calyx Femto DAC, Triangle Art Concerto turntable, Thorens MM008 phono preamplifier, Ayre CX-7e CD player, and the Pass Labs XA100.8 monoblock power amplifiers). Right from the get go the difference that the SR Ground Block SE made was immediately apparent. The Akiko Tuning sticks also made a very discernible difference to the sound quality of my audio system. I remember thinking, the difference was akin to, on one hand, breathing the air in the middle of rush hour traffic in a busy metropolis downtown and on the other hand, walking by a lake, through a wooded conservation area and enjoying the fresh, crisp air of the leafy hiking path. However, the SR Ground Block SE took it up a notch from that. I am fortunate to be living on the shores of Lake Ontario in a house surrounded by a conservation area and equipped with a balcony that has a panoramic view of the Lake. During the summer, after a thundershower shower, I love to go out on the balcony and take in huge breaths of that clean, fresh air, loaded with negative ions and that prompts my brain to release endorphins, serotonin, and dopamine into my body that makes me tingle with pleasure all over. It would be a stretch to say that the difference that the SR Ground Block SE makes is exactly like the difference between breathing the air in the middle of rush hour traffic in a busy metropolis downtown and doing the same in a conservation area besides a lake after a thundershower, but relatively speaking, that analogy is not that far off the mark. The music is now a lot cleaner and significantly more relaxed. It flows with a much greater degree of ease and effortlessness. The musical notes of every melody sound fresh and inviting. There is now a lot more air between the instruments. I had thought that the Akiko Tuning Sticks removed all the audible grunge in the music, but I was wrong. They reduced the grunge to a level where I thought there was none left. The Active Ground Block SE proved that there was more grunge to be eliminated. I was able to reconfirm this by disconnecting and then reconnecting the unit. With the Ground Block in place, it is a lot easier to focus on any one voice when listening to a duet like Simon & Garfunkel, or even a quartet like Crosby, Stills, Nash, and Young. The lower noise floor also makes it possible to listen to music at a lower volume level without losing midrange saturation and micro details of the music. It also reduces distortion and compression when listening to music at near rock concert volume levels. Listening to Queen’s “We Will Rock You” at window rattling levels really did rock the experience. With a lot of unplugged music performances you have instruments that take center stage while other instruments remain in the background. At a live unplugged performance I find it easy to focus on, and enjoy the background instruments if I choose to. However, with reproduced music, that is a bit of a challenge if the noise element is too high. With the Ground Block, the reduced noise level makes it easier to hear the background instruments. A good example is when listening to Ana Caram’s “Viola Fora de Moda” on the Chesky Records Jazz Sampler and Audiophile Test CD. When played with the Ground Block in the mix I am now able to hear many of those background instruments with greater clarity, as the lower level of noise in the sound does not drown them out. The attack and decay of guitar strums and piano notes are now more realistic with a lot more tonal purity which brings it a lot closer to what one hears at a live performance. The reduction in grunge minimizes listener fatigue quite exponentially. I am now able to enjoy much longer listening sessions before I feel I have had enough. When I played Dire Straits “Ride Across the River,” I noticed that the sound stage is now more stable and solid, and is also wider and more holographic. The bass is now deeper and a whole lot more tuneful. While listening to Patricia Barber’s “Nardis” from her wonderful Café Blue album, the percussion renditions are crisper and more taut. The lower noise floor has also improved the dynamic range quite appreciably. Voices now have more body and presence. Very importantly, the cleaner overall sound allows more of the emotion to come through, greatly enhancing the listening experience. One of my favorite vocal albums of all time is Linda Ronstadt’s Canciones de mi Padre. With the Ground Block, I can now hear more texture and nuance in this diva’s voice, which allows more of the emotion embedded in her music to emerge. Choosing between the Galileo UEF silver and the gold tuning modules was a no-brainer for me. In my system, the silver module won hands down. It delivers micro details with an appreciable level of musicality and without sounding clinical or analytical. The gold module in my system was a bit too warm for my taste. US$2995 is not exactly chump change for many audiophiles. However, you would be hard pressed to find a tweak, at this price point, that gives you better bang for your buck. If there is a better grounding solution available for audiophile systems at this price, I have not encountered it yet! That being the case, it was an easy decision to make it a part of my reference system.